A university prospectus and website can give you a good idea about courses and student life, but wouldn’t you like the chance to speak directly with the universities you’re interested in? From February to June, you can do exactly this by attending one of UCAS’ nationwide conventions. 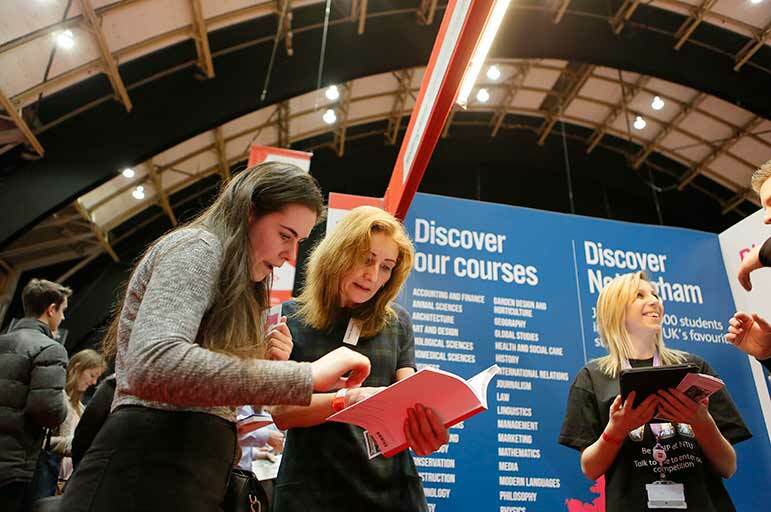 UCAS invites universities from across the country to exhibit at these events, which are perfect opportunities for you to start thinking about your options. They’re also a great way to find out about universities and courses you may not have considered or even heard of before. Which university could be for you? Whether your visit is arranged by your school or whether you choose to attend alone, UCAS fairs are an ideal way to find out which universities would suit your interests, preferences, and academic strengths. Representatives from each university are on hand to discuss courses, what the university is like, where it's located, what its graduates go on to do, and more. These events can be crowded, fast-paced and noisy, so it's important that when you get your chance to speak to universities, you ask the right questions - those which will best help you make this important decision about your future. First of all, find out whether the university offers the course or courses that you're interested in. If you haven't decided what you'd like to study yet, find out which subjects the university excels in offering. Most universities are recognised for offering outstanding courses in at least one specialist area, such as engineering, art and design or science and technology. Where is the university based? Is it a campus university on the outskirts of a town, or a bustling city centre university? The type of university, whether campus or city-based, will impact on the experience you have as a student there. Find out more about what's on offer in the town, city or campus where the university is based. How far away is the university from where you live? If you enjoy the comforts of home then moving far away might not suit you. If you're itching to explore new and exciting parts of the UK, considering universities further from home can open up more opportunities. When is the university holding open days? How do you book? Going to an open day is an important way of experiencing what the university has to offer, from facilities to accommodation and atmosphere. You'll be able to explore the campus and find out more about the surrounding area. Most universities will have information about their open days for you to take away. Find out how the university supports student employability. Graduates need to be able to offer their knowledge and skills to an employer, gained from placements, work experience and specialist university-level study. Does the university offer placements as part of their courses? Will you have opportunities to gain valuable work experience through university-run schemes? Finally, take away a prospectus from the event, or get the university to send you a copy through the post. Taking the time to read about the university and your course in more detail can help you decide whether you'd like to find out more about the university at an open day. The university representatives are there to answer your questions, no matter how big or small. Take a pad of paper and a pen to jot down notes. And remember, UCAS conventions aren't just an opportunity to pick up a stack of heavy prospectuses. They're your chance to have face-to-face conversations, explore your options and find out more about university life. 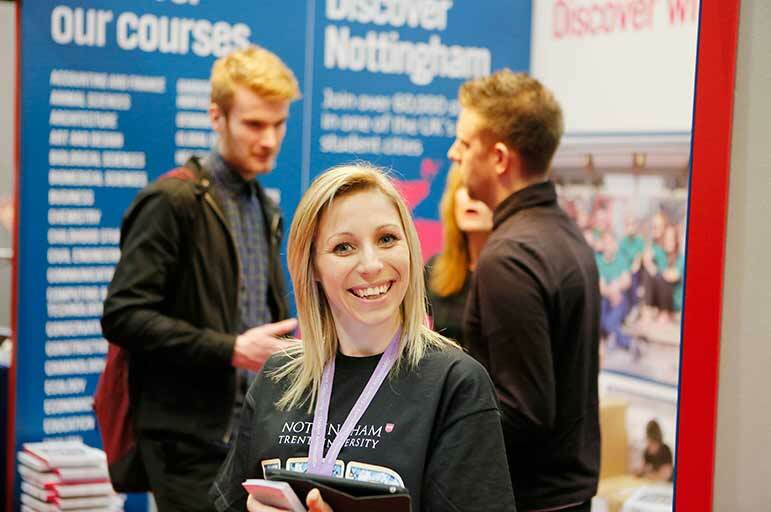 We’d really love to meet you, so why not come and speak to NTU at a UCAS fair near you? Please visit the UCAS website for full UCAS higher education convention venue details, opening times and more.